Take the first step to a healthier life by taking part in the American Heart Association’s National Walking Day. On the first Wednesday in April, we kick off a month-long celebration designed to help us all become more active. On the day of the event, participants are encouraged to lace up their sneakers and take 30 minutes out of their day to get up and walk. 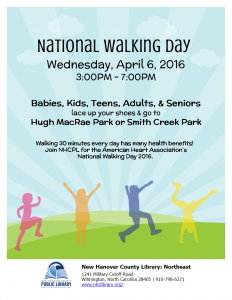 Join New Hanover County Library and Parks & Gardens at Smith Creek and Hugh MacRae Parks from 3-7pm on April 6th for a fun walk in the park!